In his new book, <em>The Dark Night Returns: The Contemporary Resurgence of Crime Comics</em>, published by RIT Press, Terrence R. Wandtke traces the history of crime comics. The American crime comic book scene has been riddled with diabolical dames, despicable gangsters and unscrupulous private detectives who have survived near extinction and are now enjoying a rebirth in mainstream popularity. In his new book, The Dark Night Returns: The Contemporary Resurgence of Crime Comics, Terrence R. Wandtke traces the history of crime comics from their beginnings to the current resurgence and analyzes the cultural forces that give rise to influential works like Frank Miller’s Sin City, Brian Azzarello’s 100 Bullets and Ed Brubaker’s Criminal. The author also discusses how the comic noir influence—a close hybrid of film and pulp fiction—becomes a visual landscape where shadows become as important as the characters. The Dark Night Returns is the third book of the Comic Studies Monograph Series published by RIT Press, the scholarly publishing enterprise at Rochester Institute of Technology. The series is edited by Gary Hoppenstand, professor of English at Michigan State University, and is designed to introduce scholars and the general reader to various theories and methods of Comic Studies, which includes graphic novels, comic books and comic strips. Wandtke is a professor at Judson University where he teaches courses on film, literature and comic books. His books include The Meaning of Superhero Comics (McFarland) and the collections The Amazing Transforming Superhero (McFarland), and Ed Brubaker: Conversations (forthcoming from the University Press of Mississippi). He is the founder of the Imago Film Festival and the area chair of Comics and Comic Art for the Popular Culture Association. 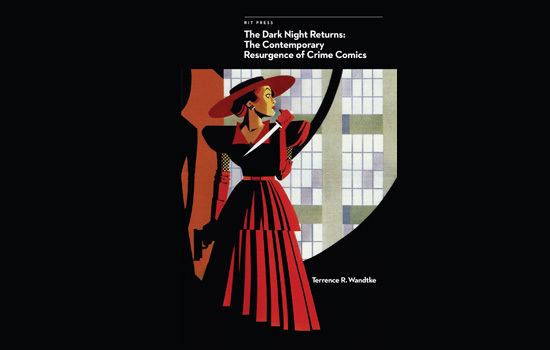 The Dark Night Returns: The Contemporary Resurgence of Crime Comics is available in softcover for $29.95 at http://ritpress.rit.edu or by calling RIT Press at 585-475-6766. Note: RIT Press is the scholarly book publishing enterprise at Rochester Institute of Technology—dedicated to the innovative use of new publishing technology while upholding high standards in content quality, publication design, and print/digital production. The Press offers specialized titles for niche academic audiences, trade editions for mass-market audiences and occasional limited editions with unique aesthetic standards.